“The design took inspiration from the firm’s name, WHITE CANVAS, an independent advertising agency. A blank white canvas takes on the personality of the artist.. We drew an analogy to Absolut Vodka’s “Absolut Blank” Campaign, where artists were invited to express themselves on a blank canvas in the shape of the iconic bottle. The clean White canvas takes on different Avatars depending on the artists’ imagination. 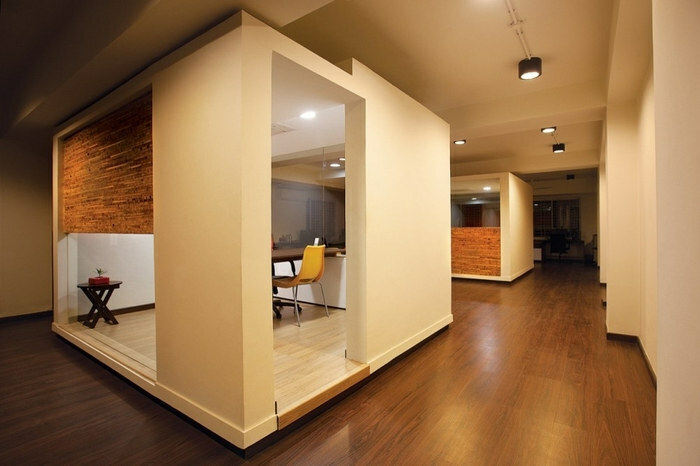 The requirement of the client included a number of closed rooms for meeting/ discussion/ideating etc. These closed spaces or ‘containers’ were envisaged to be ‘the Absolut bottle’. The infill wall for each container defines its character. Thus, each container has its own personality depending upon its user and program. Waste pieces of blockboard, generated from all the carpentry done at site, were used to create a surface and left unfinished.